Ute cornerback Javelin Guidry states his case as the fastest player in college football. Leah Hogsten | The Salt Lake Tribune Utes defensive end Bradlee Anae (6) celebrates a sack of Arizona Wildcats quarterback Jamarye Joiner on Oct. 12, 2018. Anae's return to Utah for his senior season is considered a victory for the Utes' defense. These are good signs for Utah’s defense in 2019, when the Utes will be defending their first Pac-12 South football title: Leki Fotu, Bradlee Anae and Julian Blackmon are sticking with the program, and happily so. Add to that, Javelin Guidry running on his own, and winning races. Any questions about Utah being favored to repeat were answered in early January when those three defensive stars and running back Zack Moss said they would play their senior seasons before entering the NFL draft. Utah’s defense will be built around linemen Anae and Fotu and cornerbacks Jaylon Johnson, Blackmon and Javelin Guidry, who this past weekend made a case for himself as the fastest player in college football — and in Ute history. Guidry won the 60 meters in 6.59 seconds at the Washington Indoor Invitational. That’s especially notable, considering Utah doesn’t have a men’s track and field program. A former high school sprinting champion in two states, Guidry missed running in college. So he started training this month and ran unattached in Seattle, blitzing the field. Guidry, who will be a junior in 2019, figures the track performance is “another way to showcase my speed” for NFL scouts, he told RunnerSpace.com after the race. Guidry is Utah’s slot corner, playing as a fifth defensive back in Utah’s standard scheme. The Ute defense had only four senior starters in 2018, although they were the team’s top four tacklers: linebackers Cody Barton and Chase Hansen and safeties Marquise Blair and Corrion Ballard. Blair played in Saturday’s Senior Bowl; Hansen withdrew because of a hip injury, AL.com reported. Utah’s defense will return every player in the defensive line rotation, notably Anae and Fotu, the preseason choice for the conference’s defensive player of the year, by Pac-12 expert Jon Wilner of the San Jose Mercury News. Wilner’s all-conference first team also included Anae, Johnson, Moss and receiver Britain Covey. His second team listed Blackmon, defensive tackle John Penisini and quarterback Tyler Huntley. Ute coach Kyle Whittingham has credited his key juniors for going through predraft evaluations and making informed decisions about staying in school. Oregon was judged as the Pac-12's biggest winner in that context, with quarterback Justin Herbert, linebacker Troy Dye and offensive lineman Calvin Throckmorton deferring their pro careers. The Ducks will be the consensus pick to win the Pac-12 title. Defending champion Washington is losing some senior stars, and defensive backs Byron Murphy and Taylor Rapp entered the draft as juniors. The only meeting between Utah and Oregon this season would come in the Pac-12 championship game, in the last time the contest is staged at Santa Clara, Calif. The Pac-12 and Levi’s Stadium announced last week they they’re mutually opting out of the 2020 game. That makes new stadiums in Las Vegas and the Los Angeles area potential venues, unless the conference returns the game to campus sites. 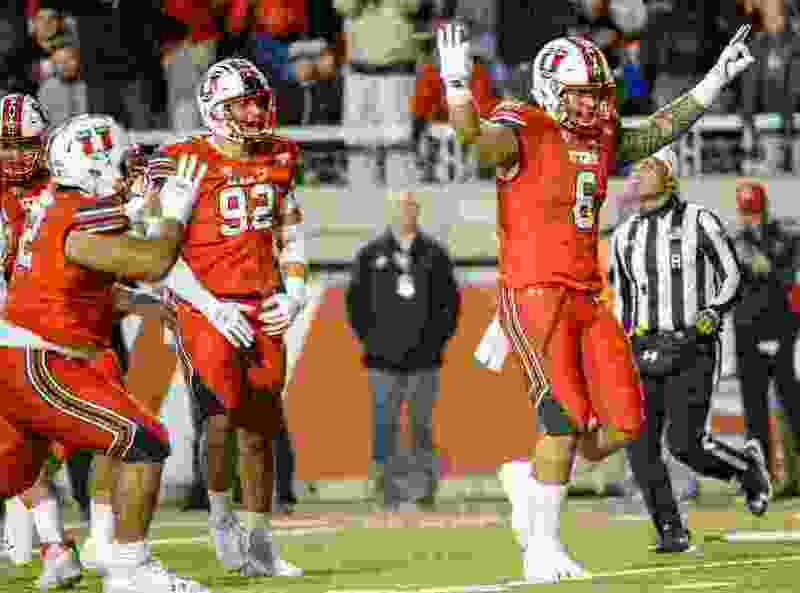 -Ute receiver Siaosi Mariner and Caleb Repp, who has played tight end and defensive end, are expected to transfer to Utah State, according to Alex Markham, publisher of Ute Nation on the Rivals network. Mariner, planning to become a graduate transfer, confirmed his move via Twitter. logan, we onna different level of drip now. God is good!! -Braedon Wissler, a Bingham High School running back who was injured in the first game of his senior season, announced his commitment to Utah as a preferred walk-on. Wissler is projected as a slot receiver. -Eastern Washington quarterback Gage Gubrud is moving to Washington State as a graduate transfer. Gubrud, who played at EWU for former Ute offensive coordinator Troy Taylor, had announced Utah and WSU as his choices. The Cougars will visit Utah on Sept. 28. -The NCAA’s next signing period begins Feb. 6. Among the key remaining targets for Utah, according to Markham, are Jordan Wilmore, a running back from Lawndale, Calif.; La’Vonte Shenault, a receiver from Desoto, Texas; and Puka Nacua, a receiver from Orem High. Nacua has not backed off his commitment to USC, but the Trojans have had an unsettling offseason with offensive coordinator Kliff Kingsbury leaving for the NFL soon after being hired and top recruit Bru McCoy transferring shortly after enrolling at USC this month.